Please help us reach our goal of $10,000 this year while we help an additional 250 children and their siblings this holiday season. 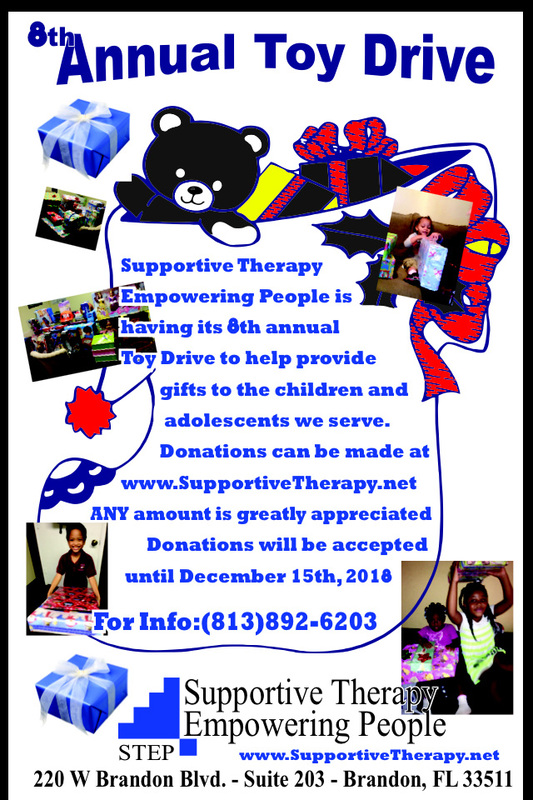 Please feel free to contact me, Reggie Vilmenay, with any questions at 813.892.6203 or at rvilmenay@supportivetherapy.net Don’t forget to look at our most recent toy drive gallery from 2017. Secure Donations can be made via PayPal by clicking this link or by checks and money orders made out to Supportive Therapy. Supplies can be dropped or mailed to our office at 220 W Brandon Blvd Suite #203 Brandon FL 33511. Thank you for your help in helping us with our community.